Introduction to the cooking hearth, its design and function. Essentials of laying, starting and maintaining a cooking fire. 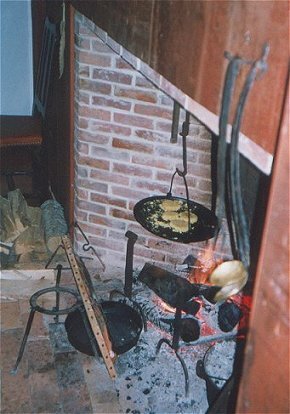 Basic hearth cooking tools and how to use them. Wear sturdy clothing (jeans recommended) and comfortable, closed-toe shoes. Baking and braising in a Dutch oven. Some previous hearth- or open fire cooking experience expected. 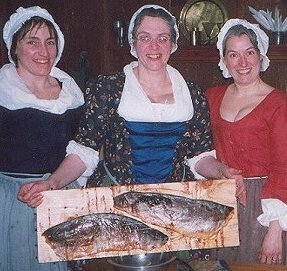 Wear your 18th century clothing for the “total” hearth-cooking experience! IF YOU HAVE ANY FOOD RESTRICTIONS, PLEASE LET ME KNOW WHEN YOU REGISTER! All workshops are taught by Sharon Ann Burnston in the period ambiance of her restored 18th century home. Class size will be small, as indicated for each class, for a truly one-on-one learning experience. All necessary foodstuffs will be provided, and classes will run from 1 pm until we’ve finished cooking, eating, and cleaning up from the dinner! Lodging is not included, but convenient low-cost lodging is available nearby. Stay over an extra night and spend Sunday combing the 20-plus antique shops on "Antique Alley" just minutes down the road! Maximum registration is as stated for each workshop. If the class maximum is exceeded, your name will go on a “cancellation list”. Your registration form and a non-refundable deposit of $30.00 secures your place at the class of your choice. The balance will be due at the beginning of the class. All registrations and deposits must be received by eight weeks prior to the date of the class. The Epsom area offers everything from fast food to fine dining! Happy Family Chinese - new menu, new chef, decent food, the tofu dishes are excellent! Dominick's-Further up the road (Rte 28N), but some of the best food around. Italian menu. Where the locals go! Zoya's-- A little further up the road, tucked away on Main St. in downtown Pittsfield. American cuisine, Weekend Buffet in a casual cafe atmosphere, at diner prices. The locals themselves are just discovering this place.